I love meal prep & rely a lot on make-ahead meals & planned leftovers to get through the week. Today, though, I’m doing things in an organized way: Cook this Meal Prep Chicken over the weekend and throw together five varied lunches for two with no repeats. Coz who wants to eat the same thing over and over? Perfectly Cooked Instant Pot Chicken – large batch for meal prep. Firm enough to slice, tender enough to shred. Below, you’ll find the recipe for the larger batch of chicken & links to five healthy and absolutely delish lunches to pack along to work. I get that sometimes it’s all you can do to get anything together for lunch, but sometimes, you just get tired of the same ol’ same ol’. Pamper yourself, make yourself a priority. You’ll be the envy of the office and won’t even think about going out! All are meals that can be cut in half for one or made for four if you’d rather have dinners for a family, but most of these meals lean to adult tastes. Honestly, if you’re feeding kiddos every night, it can be a welcome change to eat grown-up food at work! Adapt these meals to just about any of the diets out there with just a bit of tweaking, but even if you have no concerns about health or diet, these are fantastic anyway. The best of both worlds!! You’ll want to pay attention to the order of the meals, serving pretty much in order. More delicate and cold meals are served first, with heartier heat up meals at end of the week. Meal #5 is a freezer soup so there’s no issues with freshness. 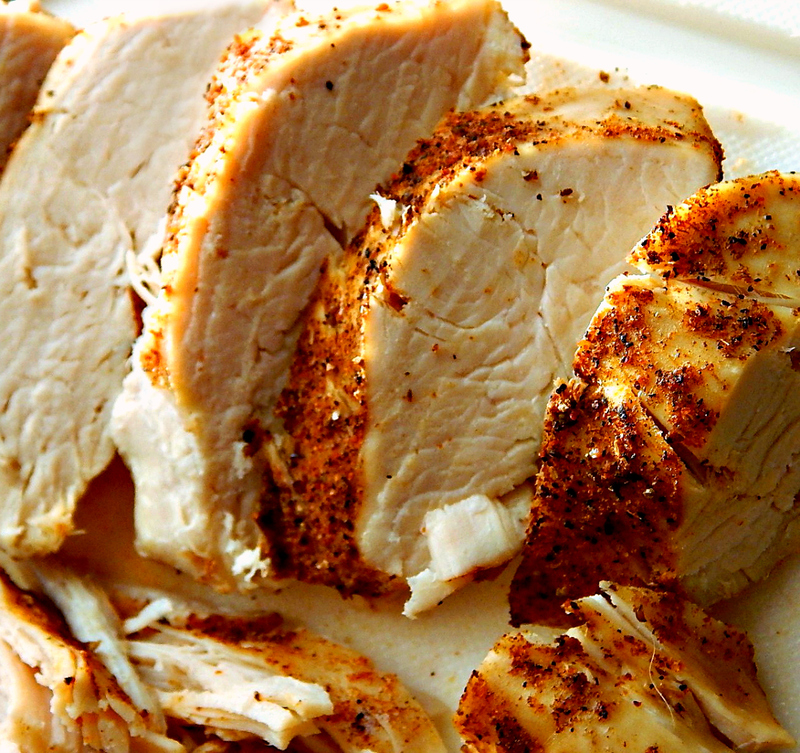 The base item for this week’s meal prep is a barbecue rubbed Meal Prep Chicken recipe. The chicken is great on its own, but the spicing mild enough so it can “morph” into different cuisines. With all the variety. I promise you won’t be tired of chicken by the end of the week. So, basically, we’re having Meal Prep Chicken x 5 meals, & many of the vegetables and the rice do double duty too. I worked to eliminate potential waste but there’s going to be some extra veggies and leftovers of the Black Eyed Pea and Rice Salad & Brunswick Stew. You’ll want work those into your dinner plans. If you follow this plan to use your Meal Prep Chicken, you’ll want to shop & prep everything at once. I added in options for shortcuts if you’re not so much feeling the prep part of the Meal Prep Chicken meals. The grocery list isn’t “pretty” but is labeled for each recipe so items are easy to remove if you deviate or shortcut. This Meal Prep Chicken is perfect for make-ahead meals for lunches! It makes enough to have you covered for the five meals on this page or you can use it for your own favorite meals. 2 to 3 tablespoons of Rib Rub, recommended is Essential Rib Rub but store-bought is fine, too. For both recipes, trim chicken of fat or cartilage. Sprinkle rib rub over chicken and rub in. Seal Instant Pot and set to High Pressure, 20 minutes. Let Instant Pot go to the Keep Warm function for 10 minutes and then release any remaining pressure. Remove chicken and save the juices for the Brunswick Stew. Preheat oven to 400 degrees F. Spray or oil a 9 x 12″ baking pan. Trim chicken of fat or cartilage. Sprinkle rib rub over chicken and rub in. Place in baking pan, spray with olive or other oil and roast until internal temperature reaches 165 degrees, about 25 to 35 minutes, depending on the size of the breasts. Save any juices that have accumulated in the pan for the Brunswick Stew. How much chicken is needed? Measuring chicken from raw to prepared always has a bit of variance. 4 1/2 pounds should be just enough, after trimming and cooking, to cover all the meals. Larger family packs usually are the best price and generally run between 5 and 5 1/2 pounds. Either freeze a breast or cook it all and have a little extra. First are the meals and links along with any special instructions you might need to package & shortcuts if you’d like them. Towards the bottom of the page, a printable grocery list with everything you need. The ingredients are labeled as to what goes into what recipe, so they’re easy to remove if you aren’t making everything on this post. The printable list also has instructions to prep all ingredients at once. The Shaved Brussels & Kale Salad with Sliced Chicken Breast recipe serves 4. Divide the recipe in half. (The grocery list reflects this.) Serve with Lemon Tahini Dressing or another choice. When ready to serve, mix salad with dressing, top with chicken & croutons. To shortcut this recipe, use a bagged salad and/or a prepared salad dressing & prepared croutons. To make the pulled chicken, just add 1/2 cup (or as much as you’d like) of barbecue sauce to about 1 1/2 cups chicken. Make the Simple Carrot & Cabbage Slaw and the Cilantro Lime Rice. Use a cup of the Cilantro Lime Rice in Black-Eyed Pea & Rice Salad, and save the rest for the Shortcut Fajitas, later. You’ll have extra of both Salads. Add a bun, if you want. When ready to serve, remove the pulled pork and heat in the microwave for about a minute. Shortcut this recipe with prepared salads or a good cole-slaw blend. The Vietnamese Chicken Salad Recipe already serves two. When ready to serve, top salad with chicken & the chopped herbs. Drizzle the dressing over and toss lightly. Sprinkle with nuts and serve with a lime wedge. Shortcut this by using a store-bought dressing and/or a mixed salad bag. Make the Shortcut Chicken Fajitas and use the remainder of the Cilantro Lime Rice. The rest was used for the Black Eyed Pea & Rice Salad. When ready to serve, remove salsa & garnishes and heat the fajitas in a microwave for about two minutes. Serve with the lime, salsa, and garnishes of your choice. If using a tortilla, to warm, drape over the fajita mixture in the microwave for the last 30 seconds of cooking time. Shortcut this recipe by using a mix of frozen fajita vegetables. The Brunswick Stew serves 8. I’d recommend portioning two individual sized containers for meal prep meals for this week & freezing. The rest portion or freeze as appropriate for your family. Place in the fridge when the destination is reached. When ready to heat, remove crackers & fruit and microwave for several minutes, stirring once or twice. Items in the list are noted with the code for recipe its used for. If you’re not making that item, the code makes it easy to identify & remove. It’s easiest to prep everything, then divide. This is a printable PDF format. I think I’ve covered everything I can think about to get you five great meals from this Meal Prep Chicken. This turned out to be one of my more complicated posts by the time I was all finished so let me know if I missed anything. I love all these meals, but what are your fave meals for meal prep? I’ll be bringing Meal Prep Chicken to Fiesta Friday #214, hosted this week by Abbey @ Three Cats and a Girl and Antonia @ Zoale.com. There’s always a lot of great bloggers & a lot of great recipes, but I couldn’t help but notice a few St. Paddy’s Day & Easter recipes being posted! This entry was posted in Click here for Bargain Meals, Click here for Fabulous Food Posts and tagged Chicken, Chicken Breast, Instant Pot, Meal Prep, meal prep chicken. Bookmark the permalink. Brillant Mollie!! the young moms I work with at MOPS will love the link to this! thanks. You are amazing! Hi Rhonda, I had to look up MOPS = that sounds like an incredible group! I remember when my kids were little, it seemed like half my meals were just picking off what was left on their plates! I think my daughter does the same, so that was a bad example set! Oh gosh– I’m still a plate picker when the grand girls are here. and MOPS is so much fun– great speakers and time for the girls to talk through all the ups and downs of being a mom. Last Friday night the girls from my table all came and cooked dinner together. They stayed til well after 11:00! So fun! hugs from here Mollie. Thanks! It was my pleasure. I seem to remember years ago having a program that spit out grocery lists. I’m going to have to check on that! Brilliant post Mollie – so many great ideas just with the roast chicken. I’m always looking for new recipes for chicken, because it seems like I make the same thing every time. One idea also is if you take leftover rotisserie chicken (like from Costco) and make fried rice with it. Hi Britt, thanks for stopping by! Love you blog name, btw!! I love fried rice in just about any form with just about any kind of meat & veggies. It would be such a quick meal with Rotisserie chicken. Thanks much! Always nice to hear. Great ideas for busy folks, useful suggestions. I think it was the people at Food 52 who did a whole cookbook with these kinds of recipes. I am never so organized. I think I should check out their cookbook! You’re forgiven. 😉 Your book should reach you this week. Thank you SO much!! I’m thrilled!